Increased worker safety is a major feature of new families of bolting, pumping and safety technologies being introduced to Australasia by Enerpac, an international leader in extreme force tools. “Enerpac has extended its respected brand into new pumping, bolting, pipeline, pre-stressing and post-tensioning technologies,” says Enerpac National Bolting Manager, Pat Molloy. Bolting and fastening technologies from Enerpac can handle tough jobs encountered by mining, gas, petroleum and contracting industries. Versatile square and hexagonal drive torque wrenches like W and S rigid steel types, with great power to weight ratios. 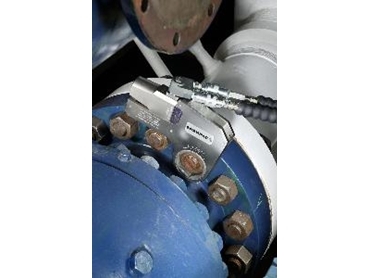 Precise and time-saving hydraulic nut families, particularly useful in applications involving critical tolerances, multiple bolting tasks and high levels of repeatability. Powerful bolt tensioners and highly portable torque multipliers to provide 1015 - 10,845 Nm of force for tightening and loosening of nuts, bolts and corroded fasteners requiring high torque. New-generation Z-class electric pump and air pump that have fewer moving parts. “They are brilliant for high-repetition tasks and have already halved the time taken for some maintenance jobs, demonstrating their effectiveness on machinery and infrastructure ranging from trucks and bulldozers to pipelines, turbines and milling trains,” he said. The new Enerpac torque wrenches are designed for maximum durability, reliability and safety, with rigid steel design and great power to weight ratios. Enerpac’s large range of time and cost-saving precision tools include families of aluminium cylinders weighing half their steel equivalents. Innovations in the Enerpac E325a Industrial Catalogue range from its highly portable families of professional bolting equipment to computerised synchronous lifting systems. These lifting systems can be operated by one person from up to a kilometre away to lift giant weights (including bridges, turbines, draglines and drilling platforms).